One of the top destinations in Japan that foreign tourists want to visit is Tokyo. Being the capital of Japan, the Tokyo metropolis has a lot to offer to visitors. With its modern buildings and high technology, the area of Tokyo is highly popular and well-known in different parts of the world. Tokyo itself is huge and houses several districts and towns. When looking for the different places to check out in Tokyo, include Shinbashi on that list. Literally translating to “New Bridge,” Shinbashi is a district located in Minato, Tokyo, Japan. Often transliterated as Shimbashi, this district is situated on the north of Hamamatsucho, east of Toranomon, west of Tsukiji, and south of Ginza. Shinbashi is different from Nishi-Shinbashi, which is also a district of Minato. Nishi-Shinbashi serves as the home of Toei Mita Line subways stations. These include Onarimon station as well as Uchisaiwaicho station. Shinbashi serves as the site of a bridge that was constructed across the Shiodome River back in the year 1604. After some time, the river was filled in. The district was also the first Tokyo terminus of the first railway in the country that was built in the year 1872. Up to this day, it is still a primary railway hub. It has undergone development and has become a commercial center. The most recent development in the area is the Shiodome “Shiosite” high-rise office complex. The area is known as a business and entertainment district located in central Tokyo. Situated on the south of the Imperial Palace Tokyo and Hibiya Park, Shimbashi is known as the quintessential “salaryman” and “office lady” quarter of Tokyo. Hence, with the redevelopments in the area such as the Shiodome, one can see the stark contrast of the regular buildings to the skyscraper standing on the other side of the JR Yamanote railway line. There are various eateries and bars that can be found in Shimbashi. These establishments provide that shitamachi, which translates to “low town,” flavor in their dishes and drinks. This is despite the fact that Shimbashi is centrally located with only two stops away from Tokyo Station. A natural point of arrival from any direction, Shimbashi houses at least seven different railway lines where they converge. There are several places to check out when Shimbashi. 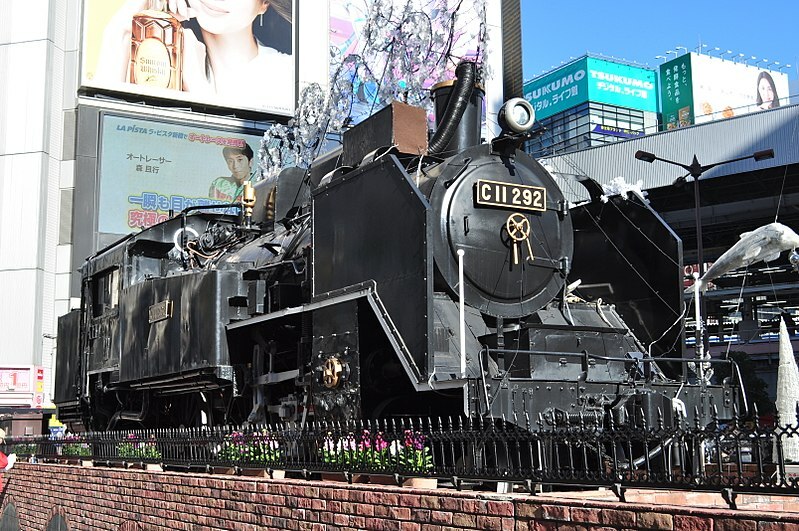 This includes the reconstructed Shimbashi Station, which is probably the most popular attraction in all of Shimbashi. This station houses a museum as well as a restaurant. Another budding attraction in the area of Shimbashi is the Shiodome Shiosite. A high-rise commercial complex, this building has a growing popularity among the locals due to its modernity. One can also check out Nakagin Capsule Tower, which is a modular residential and commercial high-rise building. A number of companies also have their headquarters located in the Shiodome City Center building of Shiodome. These inlude the corporate headquarters and public and investor relations offices of Fujitsu, the headquarters of ANA subsidiaries Air Nippon and ANA & JP Express, and the headquarters of All Nippon Airways. There are also some offices of ANA subsidiary Air Japan located in Shiodome City Center. All Nippon Airways previously had its headquarters in the Hikokan Building in the late 1960s. Other companies with their offices in Shimbashi include Dentsu, Nippon Television, Shiseido, Yakult, Kyodo News, Nittsu, Softbank, and Panasonic Electric Works with their Tokyo head office. The headquarters of Asatsu also moved to Shimbashi in May of the year 1967. However, they moved to Ginza located in Chuo in July of the year 1995. There are two stations in Shimbashi, namely, the old Shimbashi Station and the Shiodome Station. Shimbashi Station serves Ginza Line, Toei Asakusa Line, Yokosuka Line, Keihin-Tohoku Line, Yamanote Line, and Yurikamome. Shiodome Station services both Toei Oedo Line and Yurikamome. More commonly known as Shinbashi-eki, Shimbashi Station is a primary interchange railway station located in Minato Ward, Tokyo. It is only a 10-minute walk from Ginza shopping district. It is also located directly south of Tokyo Station. It is operated by four companies. The first company is the JR East. The JR East station is comprised of three surface platforms. These platforms serve the Tokaido, Keihin-Tohoku, and Yamanote lines. On the other hand, there is also an underground platform that serves the Yokosuka Line. The second company is the Tokyo Metro. It runs an underground station in Shimbashi with two side platforms. These platforms serve the Tokyo Metro Ginza Line. The third company is the Tokyo Metropolitan Bureau of Transportation or Toei for short. Similar to Tokyo Metro, Toei also runs an underground station in Shimbashi with two side platforms. These platforms serve the Toei Asakusa Line. The fourth company is the Yurikamome. It has an elevated station next to the JR Station. Recognized as the original terminus of the first stretch of railway, which is the Tokaido Main Line, in the country, Shimbashi Station is among the oldest stations in all of Japan. Just a number of kilometers down the line is Shinagawa, which is the oldest station in Japan. The original station of Shimbashi opened on the 10th of October in the year 1872. Back then, Shimbashi Station was known as Shimbashi Teishajo. However, the actual current structure was opened as Karasumori Station serving the Yamanote Line on the 16th of December in the year 1909. After some time, the original station was demolished as the station was being redeveloped to make way for Shiodome Station. This was in line with the extension of the Tokaido Main Line running along its present route going to the terminus located at Tokyo Station in the year 1914. Upon redevelopment, Karasumori Station was renamed Shimbashi Station. In the year 1934, the first subway line of the country being operated by the Tokyo Underground Railroad Company was extended to Shimbashi. Five years later, a second subway station for its line from Shibuya was constructed and built at Shimbashi by the Tokyo Rapid Railway Company in the month of January in the year 1939. The TRR station was closed as the lines were eventually merged together just after a number of months. 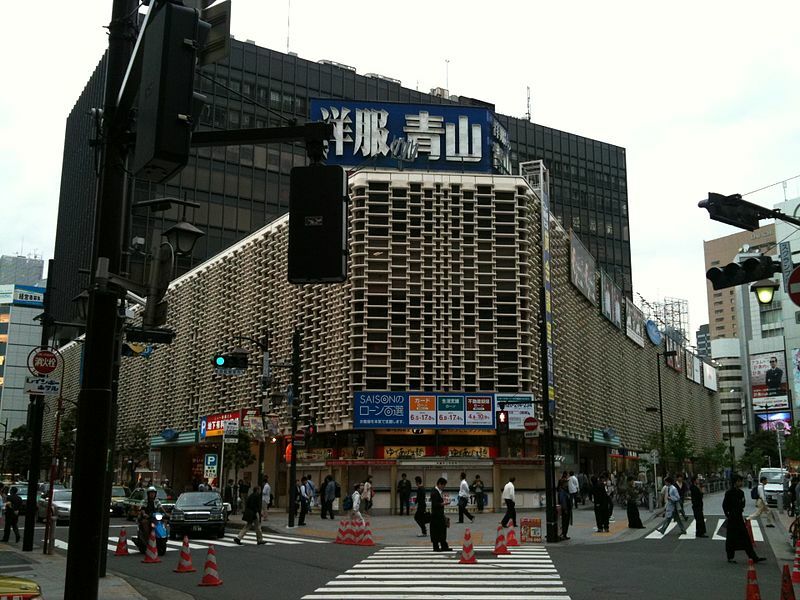 The two companies developing Shimbashi Station merged in the year 1941 and became the present Tokyo Metro Ginza Line. The Ginza Line ran from only one platform until the year 1980. From then, for the purpose of relieving congestion, a second parallel platform was built and opened. The Toei Asakusa Line started providing service to Shimbashi in the year 1968 while the Yurikamome opened and started service in the year 1995. The station icon of Shimbashi is willow. It follows a pattern incorporating a motif of willow leaves. It is believed since the ancient times that willows bring good luck. Aside from the famous old Shimbashi Station, there are also a lot of places that one can check out when in Shimbashi. First and foremost on the list is the Steam Locomotive Plaza or SL Plaza. It is considered as the most distinctive landmark of Shimbashi. It features a steam locomotive on display in the plaza. Located just outside the Hibiya Exit of JR Shinbashi Station, this grand display leaves a lot of people in awe. The display is a C11 292 model steam train that was manufactured by Nippon Sharyo back in the year 1945. 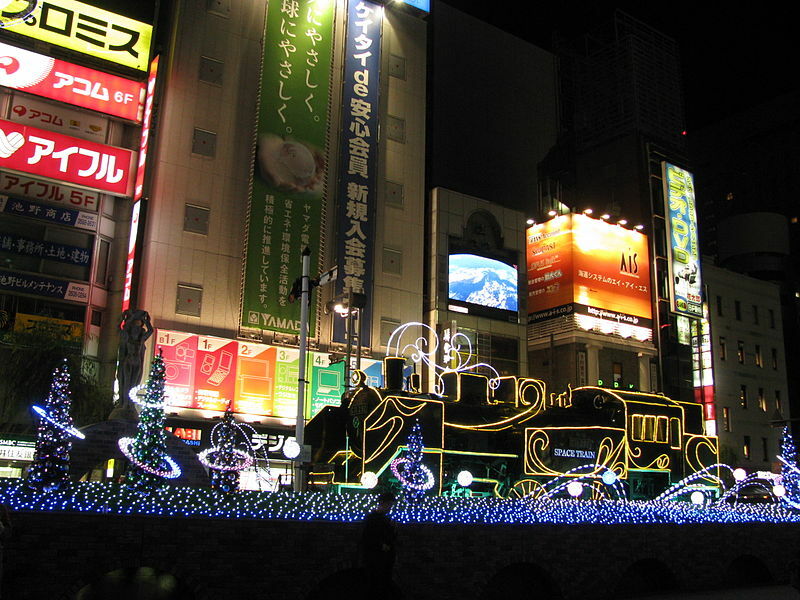 Nearing the end of the year, the train is elaborated decorated with dancing lights. The train has also become a popular meeting spot. Next on the list is the Karasumori Shrine. Most of the southern portion of the plaza is covered by the New Shimbashi Building, which can be distinguished by its white latticed facade. Just down the street behind this building stands the Karasumori Shrine. The shrine is a local tourist attraction. It has a history that dates back to more than a thousand years, reaching the Heian period. Though relatively small, this shrine features an attractive, modern look. Still, there are original traditional elements incorporated into the design and architecture of this shrine. For foodies, there are also of restaurants worth the try in Shimbashi. The block located just across the street from the SL Plaza lies the main entertainment area of Shimbashi. It can be easily accessed by taking the Hibiya Exit from the Shimbashi Station. The area is considered as a drunken “salaryman” territory especially during night time. There are a lot of karaoke bars in the area for people who wish to have a good time. If one wants to try some sake, head on over to Sake Plaza. This joint features anything related to the popular Japanese drink. It is important to note that this place is closed on the weekends as well as on bank holidays. Hence, one would have to schedule the visit on a weekday. A four-story complex, the place is operated by the Central Brewers’ Union. Cups, glasses, books, and hydrometers can also be found in this place. Should one find one’s self stuck in Shinbashi on a Friday night, definitely check out Shinshuu Osake Mura. It offers a wide range of beers that many say are spectacular. Because of its increasing popularity, expect long lines especially when ordering drinks. The place also has an interesting decor and provides good music for people wanting to chill out. Another beer joint in Shinbashi is the Shinbashi Dry-Dock. This place offers a great selection of lager. If one is feeling a bit fancy, the place also offers a wide range of wine. More than 60 bottles of beer are being offered in this place. The menu also features Japanese pub foods such as hotdogs, fried chicken, and “Napolitan” spaghetti. Because it might get busy at night, booking ahead is advised. For techy people, definitely consider putting LABI on the must-visit list. A famous electrical goods chain, LABI currently has two stores located in Shimbashi. Located across SL Plaza, the first branch consists of six floors while the second branch consists of eight floors. The first branch features LABI Digital and can be accessed by taking the Hibiya Exit of Shimbashi Station. The second branch features LABI Lifestyle and can be accessed from the other side of Shimbashi Station. There are also food and clothing stores that can be found in Shimbashi, especially in the New Shinbashi Building. Voucher stores can also be found here, for people looking for a good deal. A couple of stores in the area also sell second-hand golf equipment. Shimbashi itself is close to several Tokyo attractions such as Hibiya Park, Takarazuka Theater, Shiodome, Ginza shopping district, and Tokyo Tower. If one would be spending the night in Shimbashi, there are several hotels in the area that one can choose from. Most of these hotels are business hotels and best cater travelers on a budget. One of the good hotels in Shinbashi is the Hotel Sunroute Shimbashi. Located at the center of the district, this hotel offers compact but comfortable rooms. Only a 5-minute walk from Shimbashi Station, this hotel guarantees clean rooms with Wi-Fi. Other amenities include fridge, en-suite bathroom, and kettle. A coin laundrette can be found on the 4th floor. A cafe also sits on the 2nd floor of the hotel. The building itself is surrounded by convenience stores, bars, and restaurants among others. Another great option is the Check In Shinbashi. Located only 3 minutes away from Shimbashi Station, this place can be quite small for some people. Nonetheless, if travelers are on a tight budget, these small rooms are still tolerable. Singles can cost around 7,500 yen while doubles can cost around 10,000 yen per night during weekends. Recently opened in Shimbashi is Tokyu Stay Shimbashi. Opened in the year 2014, this hotel is a little south of Shimbashi Station. It offers clean and affordable rooms. Another hotel to check out is Hotel Unizo Shimbashi, which is located close to the station. Hence, international visitors can easily visit Shinbashi and opt to stay the night. After all, going around Shinbashi and cramping several places to visit in one day can be quite tiring. Taking one’s time and fully immersing one’s self in the distinct atmosphere would be the best way to fully enjoy the beautiful district of Shinbashi.